Although the development of fisheries in reservoirs is a very recent phenomenon, major irrigation schemes, as evident from the earliest written records in the Mahawansa, date back to the fourth century B.C. (Brohier, 1934; Parker, 1981). It is relevant to consider here briefly the historical aspects of the development of irrigation schemes in Sri Lanka. Details of the historical aspects of the ancient irrigation works of Sri Lanka are dealt with by Brohier (1934, 1937), Fernando, A.D.N. (1979), Parker (1981) and Perera (1984). Arumugam (1969) provides constructional details of each major irrigation scheme. In this present- ation the author will attempt to highlight some of the important historical aspects. The purpose and determination in the construction of the irrigation systems are depicted by the words of Parakrama Bahu the Great, 1153–1186 AD: Let not even a drop of rain water go to the sea without benefiting man. The final achievements were highlighted by Sir Henry Ward, Governor of Sri Lanka In: Collected Minutes of Brohier (1934): It is possible, that in no other part of the world are there to be found within the same space, the remains of so many works of irrigation, which are, at the same time, of such great antiquity, and of such vast magnitude as Ceylon. Probably no other country can exhibit works so numerous, and at the same time so ancient and extensive, within the same limited area, as this Island. * Reservoirs are also referred to as tanks in English and as Wewa in Sinhalese. The word wewa may be incorporated in to the name of the reservoir when it is not followed by either reservoir or tank. As such there are inconsistencies in the ways of referring to different reservoirs. According to Parker (1981) two irrigation systems were adopted from ancient times: the first was impoundment in reservoirs and the second was the diversion of rivers through excavated canals which conveyed the water into distant lands or reservoirs, supposedly a method of irrigation practised in northwestern and central India and also probably in southern India. However, Parker concluded that the formation of all reservoirs of a class with embankments much higher than those of simple village tanks was originally due to the constructive genius of the Sinhalese themselves. The works at Panduwewa, according to Parker (1981), is the first great reservoir ever constructed, if the great lakes of Egypt, which are merely immense natural hollows into which streams were turned, are not considered. This reservoir is thought to have been built by King Dappula II (807–812 AD). The earliest constructive work which can be identified with certainity in the Island is the Abhayawewa in Anuradhapura, built by King Pandukabhaya in about 300 BC; this reservoir is now known as the Basawakkulamawewa. (i) First Stage: collection of rain water in a pond or valley, lift irrigation using primitive implements to irrigate the surrounding paddies. (ii) Second Stage: development of low artificial embankments or weirs built across the valleys of small ephemeral rivulets, such a tank would have a depth of 2.5 m, tank followed downstream by yet another tank and paddy fields. (iii) Third Stage: improvement of the former type, the bunds strengthened; extent of irrigable land improved, but still not part of a complex network of tanks. (iv) Fourth Stage: damming of the bed of comparatively large non-perennial rivers, e.g. Kala Oya (Dhatusena,459 AD), water distribution capabilities increased, special channels constructed to transmit water, catchments linked. (v) Fifth Stage: construction of reservoirs on large, ephemeral rivers and tributaries, and linking these to anicuts built on rivers having catchment areas of perennial water supply in the wet zone e.g. anicut at Elahera across the Amban Ganga (tributary of Mahaweli Ganga; see De Silva, 1985 for details), built by Vasaba (65–109 AD), later enlarged and diversified by Mahasena (276–303 AD), feeds the Minneriyawewa. This stage was also characterised by building of spills and sluices. (vi) Sixth Stage: trans-basin transfer of water from a perennial catchment to an ephemeral catchment based reservoir, e.g. Amban Ganga catchment linked with Kala-Oya catchment, highest complexity by 8th century AD. All historical evidence indicates that the systems reached their highest complexity well over 1000 years ago, and it will be seen later that modern engineering has had little effect on the planning and layout of the old systems. The ancient irrigation systems in three districts, viz. Polonnaruwa, Anuradahapura and Ruhuna, are thought to have acted as the focal points of the civilization in these areas. Fernando, A.D.N. (1979) recognized 44 ancient, major irrigation reservoirs approximating 39000 ha of surface area. Almost all the major ancient irrigation works have now been rehabilitated, except perhaps for a reservoir or two which may have gone into disrepair and are covered by thick jungle. It is likely that most of the ancient works have been unearthed and their origins understood. The ingenuity of the Sinhala irrigation engineers is best exemplified by the invention of the “biso-kotuwa” (which literally means queen - enclosure), later termed by Parker (1909, in 1981) “bisi-kotuwa”, the enclosure where the water level lowers. The “bisikotuwa” is the equivalent of the valve-pit, which functions in the regulation of the outward flow of water and is therefore essentially an invention made by the Sinhala irrigation engineers more than 2200 years ago. It has remained essentially unchanged since then (Brohier, 1934; Needham, 1971; Parker, 1981). “It was this (=biso-kotuwa) invention alone which permitted the Sinhalese to proceed boldly with the construction of reservoirs that still rank among the finest and greatest work of its kind in the world” (Parker, 1909, in Parker, 1981). It is also recorded that in the design of dams built across rivers the early Sinhala engineers showed ingenuity. The dams were built at an oblique angle, exposing the masonry to a lesser degree of violent shocks caused by impact of large floating tree trunks and other debris. No historical account on the reservoir systems in the island will be complete without reference to the works of King Parakrama Bahu (1153–1186 AD). This ruler is reputed to have been responsible for the construction or the restoration of 165 dams, 3910 canals, 163 major tanks (=reservoirs) and 2376 minor tanks, all in a reign of 33 years, perhaps reaching the zenith of development in irrigation and agriculture of the Sinhala race during its 2500 year history. - the construction of hill-country hydroelectric schemes and associated reservoirs. Plans have also been made for the development of the Kalu Ganga, the river which has the highest annual discharge. This scheme, completed in 1965, involved the construction of three major reservoirs, the Udawalawe Reservoir (3415 ha), the Chandrika Wewa (448 ha) and the Ridiyagama Reservoir (888 ha). It also involved restoration and construction of minor irrigation reservoirs, anicuts and channels. basins, is a multi-purpose development scheme which not only incorporates some existing reservoirs into the system but also involves the construction of a number of major reservoirs for the generation of hydro-electricity and/or for irrigation. The details of this scheme have been given by De Silva (1985). Kirindi Oya was one of the two pre-Christian masonry dams in Sri Lanka. This dam permitted the development of the reservoir system in the ancient ‘Ruhuna’ civilization, in the southeast region of the island. The modern development of the Kirindi Oya Scheme constitutes the construction of a major reservoir, the Lunugamwehera reservoir (impounded in 1986). Details of the development scheme are given in Table 7. With the increasing accent on the development of irrigation and hydroelectric reservoirs it is appropriate to consider a few general features associated with such developments. The new development schemes may affect the water regimes in the existing reservoirs. For example the Mahaweli Ganga (= River) Development Scheme is bound to affect the water regime of a number of existing ancient major reservoirs. The details of such influence through expected minimization of water level fluctuations, shorter retention time and consequent effects on the fisheries have been given by De Silva (1985). These changes could affect the existing fishery directly via the habitat limitation for nest-building by the dominant species O.mossambicus, or indirectly by reducing the nutrient availability in the system. Fig. 5. Schematic diagrame of the water flow in the Mahaweli Ganga Development Scheme (adapted from Mahaweli Ganga Projects and Programmes, (1983). The new developments have rarely considered the potential contribution of the fisheries sector in the cost-benefit analyses at planning stages and the likely socio-economic importance and impact on the population (e.g. the Mahaweli Ganga Development, De Silva, 1985). Future projects should consider at least the most critical needs for sound fishery development. The question of the reservoir bed preparation, particularly whether a certain proportion of the wood should be left intact, has been reviewed by Ploskey (1985). He discusses the pros and cons for the fish populations of leaving a proportion of the vegetation uncleared in reservoirs in Canada and in the United States. It is suggested that a proportion of the terrestrial vegetation should be left intact, provided that there are no irrigational, hydrological or civil engineering requirements for its clearing. However, submerged vegetation hinders fishing activity. In Sri Lanka the retention of vegetation is known to enhance fish production in Parakrama Samudra reservoir (Amarasinghe and Pitcher, 1986). But all reservoirs constructed in the last five years had the beds cleared and mostly even the scrub was burnt. In such reservoirs the initial phase of high fish production, typical of newly impounded reservoirs (Bhukaswan, 1980; Balon and Coche, 1974), may not take place. A policy on reservoir bed preparation addressing the future reservoir fisheries needs is still to be formulated. The number of reservoirs in Sri Lanka is not a accurately known. This concerns in particular the small reservoirs known as village tanks and/or seasonal tanks, which are very common in most parts of the dry zone (Fig.6). Abeywickrema (1955) cited the total number of reservoirs in the island to be over 10,000. Mendis (1977), from available irrigational statistics, deduced it to be around 3,500, while Udawattage (1985) suggested over 20,000 micro-catchments, across which earthern dams were built to form minor reservoirs. It is possible that the high estimates by Abeysinghe (1982) and Udawattage (1985) resulted from the inclusion of anicuts. Thayaparan (1982) put the number of functional minor reservoirs in the country at 3,279. Recent estimates suggest that nearly 7,000 seasonal tanks are operational (Anon., 1986). The present reservoir surface area on the island and their distribution, district wise, are shown in Fig.7. What is more relevant from a fisheries point of view is the surface area of different types of reservoirs. The classifications adopted from a fisheries development view thereof and the surface of each type are summarised in Table 8. The above classification of the reservoirs is essentially an extrapolation of the irrigation classification, which can be applied to fisheries development as well. (ii) Minor irrigation reservoirs are also termed seasonal and/or village tanks. These reservoirs are built across micro-catchments, and are typically located in village centres. The most characteristic features of these reservoirs are: they dry up almost completely for 3–4 months of the year, and their surface area is generally less than 20 ha. These reservoirs come under the jurisdiction of the Department of Agrarian Services. (iii) Hill country reservoirs are built almost exclusively for generation of hydroelectric power. They are located in the upper catchments of the major rivers at altitudes above 1000 m. Most of these come under the jurisdiction of the Ceylon Electricity Board. Fig. 6A. Distribution of seasonal tanks (from Cook, 1931). 6B A group of seasonal tanks and the associated paddy fields indicating the intricacy of the systems. Fig. 7 The reservoir surface area (in ha) and the number in each administrative district of the island. Also shown are those reservoirs exceeding 2500 ha surface area (after Fernando and De Silva, 1984). are likely to have a determining influence on the hydrobiology of the individual reservoirs, a fact which will become apparent later. Different types of reservoirs and the total surface area of each type. Where known their number is given in parentheses; a-estimated upto 1990 taking all development schemes into consideration. From a fisheries point of view the reservoir features, i.e. morphological, hydrological and hydrobiological will be restricted to perennial, i.e. major and medium scale irrigation reservoirs, and to village reservoirs (=seasonal tanks) as these are the ones of importance from the fisheries point of view. Their morphometry is very variable. However, certain common features can be recognized. The ancient reservoirs, in general, are shallow with an even, small gradient (Fig.8). The mean depth of these reservoirs at full supply level does not exceed 15 m and in most cases the mean depth is 5–10 m. On the other hand, the newly constructed reservoirs are deep and in most cases have a deep gradient. The mean depth at full supply level may reach 40 m, such as in the Muruthawela reservoir. The hill country reservoirs, and in particular the new hydro- electric reservoirs, have a precipitous slope and are very deep. Even within a reservoir the morphometry may differ from area to area or from basin to basin. For example, the Parakrama Samudra (=the Sea of Parakrama), built in the 12th century, is a reservoir of 2262 ha at full supply level. It consists of three basins, the morphometry and the hypsography of which differ from one another significantly (Fig.9). Fig. 8. The morphometry of some selected reservoirs (adapted from De Silva, 1987). The seasonal tanks created by earth dams across the torrents of micro-catchments cover an area of 4 to 50 ha each but most are less than 12 ha. They are very shallow, ranging in depth from 1 to 4 m at full supply level. The basins are shallow with a gradual slope. Little is known of their morphometry (Udawattage, 1985). A typical hypsographic curve for a seasonal tank is shown in Fig.9. The most important hydrological factor in the reservoirs is the change in the water level. The changes in the water-level are linked to the rainfall pattern, when the reservoirs tend to fill up. During this period the demand for water for agricultural purposes is also minimal. With the onset of the dry period, when the inflow is minimal to nil and with the consequent demand for cultivation, the water level begins to decline. The effect of water level fluctuations on fish production is beginning to be understood (Welcomme, 1970; Martin et al., 1981; Beam, 1983; Miranda et al., 1984; Henderson, 1985; De Silva, 1985b, 1986). Bernacsek (1984) and Hall (1985) recognised that research on water level manipulation and its effects on fish populations was a priority in reservoir fishery management. The annual water level fluctuations in perennial reservoirs are extensive (Fig.10). The fluctuations in the water level tend to expose the littoral areas to varying degrees in the different reservoirs. The extent of the area thus exposed varies from reservoir to reservoir (Plate I) and may have an effect on the recruitment pattern to the fishery. In general, in Sri Lankan reservoirs even small fluctuations in the water level brings about a significant change in their capacity. As the name implies the perennial reservoirs retain water throughout the year. However, in exceptionally dry years some of the smaller, and some ancient major reservoirs in particular, may dry up completely, such as for example the Tissawewa (234 ha) and Yodawewa (488 ha) in the southeastern part of the island. In these two reservoirs, in August-September 1984 only small pools in the centre remained. The effects of such drying of reservoirs on the flora and fauna and on the fish yield are little understood. Fig. 9. Detailed morphometry of the Parakrama Samudra and hypsographic curves of its three basins (after Schiemer, 1983); hypsographic curves of the seasonal tank Dalukanwewa (after Fernando & Ellepola, 1969), and of the perenial reservoir Ridiyagama. Fig. 10 Mean monthly water level of four perennial reservoirs depicting the extent of fluctuations through the year. The vertical lines indicate the minimum and maximum (data from the Department of Irrigation). These reservoirs tend to dry up towards the latter part of the drought period, namely in July to September. Unfortunately, the water level fluctuations of these reservoirs are not monitored regularly, because of their large numbers and because such monitoring appears to be of little use in their hydrological management. 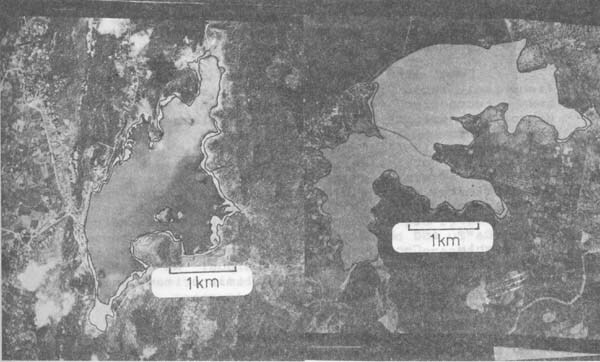 Plate I. Aerial photographs of two Sri Lankan perennial reservoirs indicating the high and low water lines. There exists a number of limnological studies of Sri Lankan reservoirs with the most comprehensive one being that of the Parakrama Samudra (Schiemer, 1983). Some of the more important studies were summarised by Fernando and De Silva (1984). The present paper deals only with those aspects, which are thought to directly or indirectly influence fish production in reservoirs. The nutrient availability in a reservoir depends on (i) the autochthonous input from the soil of its basin, degradation of detritus and, when present, the leaching of the submerged vegetation; and on (ii) the allochthonous inputs from the land run-off from its catchment. Nutrients may be added to the system by human activity, roosting and feeding bird fauna and cattle. The impact of the latter factors are little known, difficult to quantify and in most reservoirs may be of little significance. From the point of view of development of fisheries, those limnological characteristics which have been recognized as being important are the total dissolved solids (Ryder, 1965; Oglesby, 1977), the PO43- and NO3- contents (Oglesby, 1977; Cochrane and Robarts 1986), primary productivity (Melack, 1976), the pH and total alkalinity. The latter two criteria are known to affect fish growth through effects on metabolism. Briefly, waters of acidic pH<4.0, induce the gills to secrete mucus which hinders oxgen uptake and stresses the animal. High HCO3- alkalinity in the water may cause Ca2+ and Mg2+ precipitation, making these ions unavailable. Consequently, the non- availability of Ca2+ and Mg2+ as well as residual Na+ may hinder bone formation and growth, and limit primary production and thereby the fish yield. Continuous or relatively long-term monitoring of any of the physico-chemical and/or other limnological parameters such as the chlorophyll content or the primary production has been carried out only in a few perennial reservoirs in Sri Lanka (Table 9). Huruluwewa, Kalawewa pH, TDS, total alkalinity, Amarasinghe et al. - Total dissolved solids (TDS), measured in terms of the conductivity in μS-1 at 25°c, shows monthly variability; Except for one or two reservoirs (such as Huruluwewa, Muruthawela) the overall yearly conductivity of the water almost always exceeded 250 μS and in some reservoirs such as Badagiriya Wewa it averaged 700 μS. - All investigations have indicated that the pH of perennial reservoirs is either neutral or slightly alkaline, and remains so throughout the year. - Studies by Gunawardene and Adikari (1981) have indicated that the HCO3- alkalinity in some of the Mahaweli reservoirs is not so excessive as to bring about high residual sodium carbonate. Studies of this type are needed for other reservoir systems to clarify the significance of the HCO3- alkalinity for reservoir fisheries. - The Parakrama Samudra study of Gunatilaka (1983) indicates that the algal population could be phosphorous-limited at certain times of the day, whilst the nitrogen concentration was well above the limiting value. This study also indicates that strong stratification in the lake could have brought about the phosphate limitation by creating a barrier against mixing. Gunatilaka and Senaratne (1981) observed that though the algal productivity was high in the Parakrama Samudra, the overall nutrient availability was low. This observation caused them to hypothesize the dependency of the algal biomass on internal recycling of nutrients. - Bauer (1983), on the basis of his work on the Parakrama Samudra reservoir, suggested that in tropical shallow reservoirs water heating and cooling are the dominant factors governing the daily water mixing and the recycling of particles and nutrients. Information available on the phyto- and zooplankton is still scanty. Generally, blue-greens (Cyanophyceae) are known to predominate the phytoplankton biomass in shallow tropical reservoirs (Sreenivasan, 1970; Uhlman et al., 1982). In Parakrama Samudra, the dominant group by number of taxa were the Chlorophyceae (30 species), followed by Cyanophyceae (22 species), Zygnemaphyceae (11 species), Euglenophyceae (6 species), Dinophyceae and Xanthophyceae (5 species each), Diatomophyceae (3 species) and Cryptophyceae (2 species) (Rott, 1983). The phytoplankton numbers were reported to increase after the rains and during the dry periods the numbers declined markedly (Apstein, 1907, 1910; Holsinger, 1955). More recently Amarasinghe et al. (1983) in their studies on seven lowland reservoirs reported an increase in dissolved oxygen content in conjunction with phytoplankton increase. Bch1 = -1.9947 + 0.0025 BFw ( p < 0.01). the biomass being expressed in mg 1-1. The above relationship is thought to be characteristic of blue-green algae dominated freshwaters. Seasonal variations in phytoplankton biomass and shift in dominance through the year between major taxa were reported for all the seven reservoirs studied by Amarasinghe et al. (1983). In comparison to our weak knowledge of the phytoplankton of the perennial reservoirs, zooplankton is better known, even though there is an apparent 6paucity of quantitative studies. As in the case of most parameters, the zooplankton of Parakrama Samudra is the best documented; some long-term trends and seasonal changes were documented by Fernando and Rajapakse (1983), the composition, density and distribution by Duncan (1983) and aspects of the dynamics of groups of selected zooplankters by Duncan (1983), Duncan and Gulati (1983) and by Newrkla and Duncan(1984). - the crustacean assemblage was notably poor in biomass and diversity and may be affected to a greater extent by the flushing rate (Duncan, 1984). The study of Fernado (1980) on the zooplankton of all types of Sri Lankan freshwaters also revealed the paucity of crustacean zooplankters in the limnetic zone and the dominance of Brachionus species. He also noted the absence and/or the scarcity of large crustacean zooplankters such as Daphnia in Sri Lankan reservoirs. The variability of the species dominance in reservoirs is indicated in the examples given in Table 11. This limited data also reveal that the density of crustacean zooplankton is not likely to be dependent on reservoir age, size or depth; Muruthawela-the newest and the deepest reservoir cited in the above example did not record the lowest density of cladocera and copepoda, and as will be evident later, the zooplankton density was not necessarily correlated to the fish yields in the reservoirs. Detailed benthos studies of Sri Lankan reservoirs are lacking. The benthic productivity in the major reservoirs was reported to range, in dry weight, between 4.5 to 41.0 kg ha-1, with an overall mean of 16.2 ±9.6 (Mendis, 1965). The main groups that contributed to the benthic production were chironomid larvae (X-35.5; SD±28.0), Corethra larvae (X-43.0; SD ±34.0), oligocha- etes (X-18.0; SD±24.2) and molluscs (X-8.6; SD±9.3). Newrkla (1983) studied the sediment characteristics of the Parakrama Samudra and concluded that the ratio of the pelagic to benthic mineralization was 9:1. He attributed the significantly higher pelagic zone mineralization to wind and thermally induced currents and to the high temperature of the lake water which enhances the mineralization processes of organic matter. Both these factors could be expected to be found in a vast majority of the Sri Lankan reservoirs. Studies on the quality of food material ingested by O.mossambicus in a number of reservoirs have also shed light on the detrital quality of the bottom sediment in reservoirs (De Silva, 1985b). According to this study, indirect evidence indicates that for the deposit feeding fish, the detrital quality of the 12 reservoirs subjected to investigation was good, with an average protein content of 20%, and that differential deposition of detrital material in the bottom sediment is unlikely to occur in Sri Lankan reservoirs. In other words, detrital material of similar quality is likely to be evenly distributed over the whole bottom of each reservoir. The limnological investigations on Sri Lankan reservoirs have considerably contributed to our knowledge of shallow tropical reservoirs. Rigler (1982) critically evaluated the relation between fisheries management and limnology between which is thought to be a wide gap. He pointed out that this gulf is primarily due to the lack of a proper appreciation of the significance of empiricism in environmental science. The question arises at this point whether the limnological information is sufficiently accurate to undertake proper managerial measures, and if not what information should be acquired. The perennial reservoirs in Sri Lanka provide a challenging opportunity to limnologists as well as fisheries biologists for testing hypotheses; the systems provide a concentration of reservoirs in the same climatic regime but with variable hydrology. Still, the basic limnological parameters for groups of reservoirs, perhaps grouped according to their hydrological regimes, are needed on a long-term basis. At present, the limnological data available are inadequate to make meaningful predictive models. This aspect will be considered in detail later (see 6.4). Sri Lankan reservoir systems also offer a challenge for numerous limnological studies such as: clarification of the paucity of large crustacean zooplankters in the perennial reservoirs; nutrient dynamics in relation to hydrological regimes; the role of piscine predators, in particular birds in nutrient dynamics; the nature of the benthos in relation to hydrology, morphometry, nutrients and other factors. Limnological features of seasonal tanks (adapted from De Silva, 1987). Our knowledge on the limnology of seasonal tanks is considerably poorer than that of perennial reservoirs. Much information on the limnology of these reservoirs has not been published, and what is known is summarized in Table 12. With the recent accent on the use of these reservoirs for fish production it is expected that in the next few years studies on their limnology will intensify.